An uncontested divorce or dissolution is widely touted as the easiest and least expensive way to end your marriage. The exact process can differ by state, but it invariably requires that spouses agree to and sign a property settlement agreement. If you're unfamiliar with the term, it may be because the agreement is called something else in your state; your jurisdiction may refer to it as a marital settlement agreement, a separation agreement, or even a stipulated judgment after the terms are included in a court order. However, the rules are basically the same, no matter what you call it. When your divorce is uncontested, it means you and your spouse do not require the court to decide anything for you because you've reached an accord on every possible issue on your own. Your property settlement agreement precisely sets out these terms. Some states, like Ohio, require that you submit your agreement to the court at the same time you file for an uncontested dissolution. 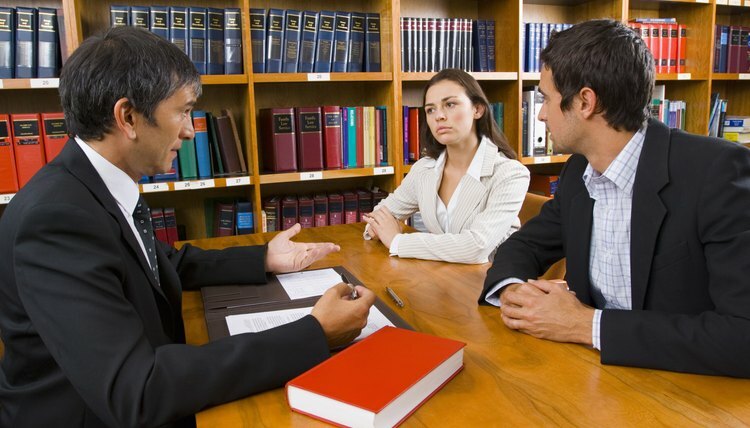 In many other states, you may negotiate a settlement at any time during the divorce process. In Virginia, if you submit a signed settlement agreement to the court, the state offers a reward: if you don't have children, you can qualify for a no-fault divorce six months sooner. When you sign a voluntary agreement with your spouse, you avoid placing important decisions in the hands of a judge. Ideally, your property settlement agreement will cover every possible post-divorce eventuality, as well as resolve all marital issues. You must cover all the usual aspects of divorce: custody, visitation, child support, property division, debt division and spousal support. You should also consider including provisions for how you want to handle a change of circumstances down the road. For example, you might agree to pay your spouse alimony, but might also want to address what happens if she remarries. Further, you might want to address if you want to give the court jurisdiction to modify the amount you're paying should you lose your job. Also, if you are giving your spouse residential custody, but then your teenager decides that he wants to live with you instead, you might want to determine how you will deal with this situation as well. You can provide for how you want to resolve all these types of issues in advance -- and include terms for enforcement in the event that one of you breaks the agreement's terms. If you want the court to include the terms of your property settlement agreement in a divorce judgment or decree, a judge must typically approve and sign off on it. As a practical matter, judges almost invariably do so unless the agreement is unconscionable – meaning it's grossly unfair to you, your spouse or your children – or you forgot to include something important. If a final hearing is required in your state, the judge may ask you if you understand the legal implications of what you signed -- and he might want to determine that you signed the agreement voluntarily without your spouse coercing you into the terms in any way. Your property settlement agreement is enforceable as a contract if you and your spouse remain separated, but not divorced, indefinitely. If one of you breaks its terms, you must file a breach of contract suit in civil court, as family court has no jurisdiction to enforce. This can be tricky if you have children and your agreement includes provisions for custody or child support. Depending on where you live, these issues may not be enforceable without a court order – which a signed property settlement agreement, by itself, is not. If you decide to divorce and ask the court to incorporate your agreement's terms into your divorce decree, you can then go back to family court for enforcement of all its provisions. Ohio State Bar Association: Divorce and Dissolution – What's the Difference?